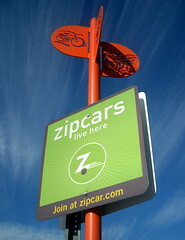 Zipcar sign in Washington DC. Photo by NCinDC via Creative Commons/Flickr. This December, Zipcar is bringing a much more welcome gift: the return of a Zipcar location on Beacon Hill. Two vehicles will be located at the El Centro de la Raza parking lot at 16th Avenue South and Roberto Maestas Festival Street. The cars, a Nissan Sentra nicknamed “Seahawk” and a Kia Soul named “Shapeshifter,” will be available to Zipcar users for $8-10.25 per hour (depending on vehicle) or, in the case of the Sentra, $72 per day. Along with the Beacon Hill location, there are two other Southeast Seattle Zipcar sites: Rainier Avenue South/South Angeline, and South Othello Street/MLK Jr Way South. Sara Hasan liked this on Facebook. YES, finally. I’m very happy about this. I meant to email you this Monday. Maybe Zipcar is telepathic. Or it’s reading your email Wendi. In any case, good news. Robert McConaughy liked this on Facebook. It looks like the new service Car2Go which allows one way trips is providing service north of McClellan (https://www.car2go.com/common/data/locations/usa/seattle/Seattle_car2go_operating_area.pdf), so trips starting there and going north (up to 125th) are acceptable.